Ubiquiti Networks RocketM900 ®. The AY09G12M2-PRO features dual polarization. This antenna is ideal for LOS or NLOS applications. Antenna Connectors (2x) RP-SMA Male Plug. Dual Slant ±45° or Vertical/Horizontal ±45° Polarization. This 4g signal amplifier has a adapter which use 110-240V input which you can plug it in most power socket. 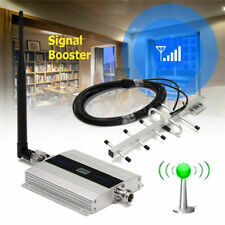 This phone signal booster has a manual which give you instruction on building up the signal network. 1 x Cell phone signal amplifier 1 x US Plug 2 x Antenna. - Output powder: DC 5V-2A. - Input power: AC 100~240V, 50~60Hz. - Power adapter: US plug. - Cable length: 10m. Network Details GSM, WCDMA. Network Type 2G, 3G, 4G. 1 x Signal booster. Most wireless providers consent to the use of signal boosters. Antenna Built-in. 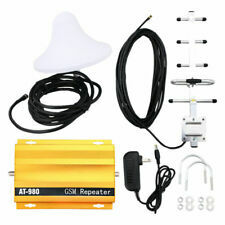 1 x Outdoor antenna w/ suction cup (10 /-2m). SCADA Systems. 900 MHz ISM band WiFi. GSM 850 / 900 MHz Cellular. Frequency Range 806-960 MHz. A versatile pole mounting bracket and U-Bolts are included. Bandwidth 154 MHz. Heavy Duty Stainless Steel Construction. Connect outdoor antenna to "BTS" port in repeater machine through cable. Fix up outdoor antenna reception on housetop and point to signal tower. 1x Indoor antenna. 1 x Outdoor 10m sucker antenna. LED Light Working & Signal Condition Indicators. Connect outdoor antenna to "BTS" port in repeater machine through cable. Fix up outdoor antenna reception on housetop and point to signal tower. Notes: It could only strengthen cell phone signal, it could not produce cell phone signal, if there is no cell phone signal at all in your area, there is no need to use it. Gain 12dBi. 1 × Outdoor Yagi Antenna. Type: Signal Booster Antenna. Power: -70 ~ -40 dBm / FA(1.23MHz). Rated Wind Velocity: 200(km/h). 14mm 18mm Male Female Glass Adapter Joint Slide Bowl Extension various size UE. 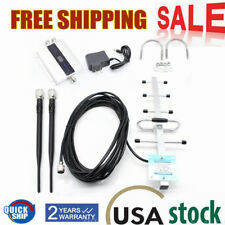 1 x Cell Phone Signal Booster 1 x Indoor Antenna 1 x Outdoor Antenna 1 x US Plug 1 x User Manual. Output Power: Up Link: 23dBm Down Link: 27dBm. - Can effectively expand the coverage area, without the interference of base station. This antenna's robust MIMO design makes it equally suitable for other 900 MHz 2x2 MIMO radios. This allows the radios to be directly attached to the antenna. Ubiquiti Networks RocketM900 ®. Separate antenna feeds are provided for each polarization. 1 x Cell phone signal amplifier 1 x US Plug 2 x Antenna. - Output powder: DC 5V-2A. - Input power: AC 100~240V, 50~60Hz. - Power adapter: US plug. - Cable length: 10m. - Color: As shown. P acking list. 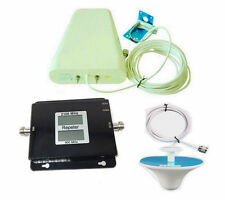 Features:The cell phone signal repeater supports GSM900 network, it supports any wireless operator in the frequency range of 890-960 MHz.Equipped with 9 meters 9dB Outdoor Yagi Directional Aerial, suit for areas where Wireless Operator's Mobile Network Signal is weak.Equipped with 3dB Indoor Aerial, signal coverage could reach up to to 150m2 without obstacle, it is the best choice for small house.No need to use extra accessories, just plug and use.Descriptions:High gain, easy installation and operation.Full-duplex, single-port design.Use ALC technology, adjust extent automaticallyLED Light Working & Signal Condition IndicatorsBig linear power, control intermodulation & scatteration stablyDependability stand by GB6993-86 standardCompatibility of e.
Trending at $37.94eBay determines this price through a machine learned model of the product's sale prices within the last 90 days. Fix up outdoor antenna reception on housetop and point to signal tower. Connect outdoor antenna to "BTS" port in repeater machine through cable. 1x Indoor antenna. 1 x Outdoor 10m sucker antenna. LED Light Working & Signal Condition Indicators. 1 x Cell phone signal amplifier 1 x US Plug 2 x Antenna. - Output powder: DC 5V-2A. - Input power: AC 100~240V, 50~60Hz. - Power adapter: US plug. - Cable length: 10m. - Size: About 20.4 x 12.8 x 3cm. 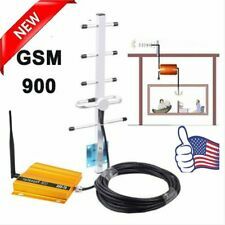 Features: This mobile phone signal repeater provides the ultimate solution in any area where cellular communications can not work well due to leak of signals. It could also improve indoor electromagnetism environments, protract cellular battery life and reduce radiation of cellphones. It is ideal for house, home, office use. High gain, fully integrated 900 MHz aerial system Powerful amplifier enables up to 85 dB of signal gain including cable loss Intelligent signal processing and real time adaptive operation Automatically adjusts power levels as needed to ensure a consistent coverage footprint. Reprogrammable (in the field) enabling spectrum or carrier reconfigurations as needed Auto-Track LED diagnostics displays aid install and operation Not interfe. Gain 12dBi. 1 × Outdoor Yagi Antenna. Type: Signal Booster Antenna. Power: -70 ~ -40 dBm / FA(1.23MHz). Rated Wind Velocity: 200(km/h). Antenna Lenght: 68cm(26.77in). Frequency Rang: 824MHz - 960MHz. Network Type: GSM / CDMA. 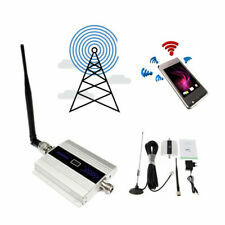 The Cell Phone Signal Booster supports GSM900 ,it works with GSM/EGSM 900MHz 2G network,it supports any wireless. 1 x Aluminium LCD DISPLAY GSM 900 cellphone repeater. produce cell phone signal,if there is no cell phone signal at all in your area,there is no need to use it. The cell phone signal repeater supports GSM900 network, it supports any wireless operator in the frequency range of 890-960 MHz. 1 x Cell Phone Repeater. Equipped with 3dB Indoor Antenna, signal coverage could reach up to to 150m2 without obstacle, it is the best choice for small house. Wilson 301129 Yagi 800-900MHz (N-Female Connector) 14.5" with Mount. The repeater device features easy installation & operation. 1 x GSM 900MHz Cellphone Repeater. So In the case we suggest you donn't buy this item. Booster Gain (dB)Gp≥58Gp≥55. Outdoor Directional Antenna Gain (dB)8. 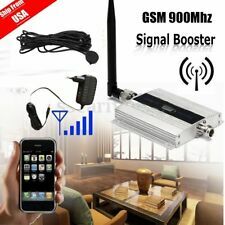 Features: This mobile phone signal repeater provides the ultimate solution in any area where cellular communications can not work well due to leak of signals. It could also improve indoor electromagnetism environments, protract cellular battery life and reduce radiation of cellphones. It is ideal for house, home, office use. Trending at $36.75eBay determines this price through a machine learned model of the product's sale prices within the last 90 days. Frequency:824-960MHz; Gain:3.5dBi; VSWR °1.5; Bandwidth:64MHz. Connector type: rp-SMA Male (female pin); Input Impedance:50. 1x 900mhz gsm antenna with rp-sma male. -a tilt-and-swivel rp-sma male connector design allows them to be used vertically,at a right angle, or any angle in-between. 3G Repeater 900MHz 1X 3G 900MHz repeater. 790-2700MHz Omnidirectional Fiberglass Antenna. Max Output Power: 17 dBm for up link/ 17 dBm for Down link. Good impact resistance, waterproofing and anticorrosion ability. Our team will be here to support you all the way from purchasing to the arrival of your item. An item that does not function as intended and is not fully operational. For parts or not working. An item that has been used previously. LED Light Working & Signal Condition Indicators. Fix up outdoor antenna reception on housetop and point to signal tower. Connect outdoor antenna to "BTS" port in repeater machine through cable. Signal Repeater Size: 140 100 20mm/5.51 3.94 0.79". 1 x Outdoor 5 unit Yagi antenna(with 10m cable). Signal Repeater Size: 140 100 20mm/5.51 3.94 0.79". Connect outdoor antenna to "BTS" port in repeater machine through cable. Fix up outdoor antenna reception on housetop and point to signal tower. The repeater device features easy installation & operation. 1 x GSM 900MHz Cellphone Repeater. So In the case we suggest you donn't buy this item. Booster Gain (dB) Gp≥17 Gp≥19. Outdoor Directional Antenna Gain (dB) 8.